I’ve been wearing Arrow & Board’s Triple Tour Split Strap for a few weeks now, and it looks way too cool for this mother of four. It’s extremely comfortable, and I already prefer the stitching to the Hermès band. The family-owned company was formed in response to the mass-produced, low-quality products on the market today. Arrow & Board operates out of a cozy leather workshop in Texas, where each of its handcrafted items is made to order. All of the small shop’s leather comes directly from Wickett & Craig, one of the oldest operating tanneries in the United States. Apple Watch bands have become Arrow & Board’s best-selling products. 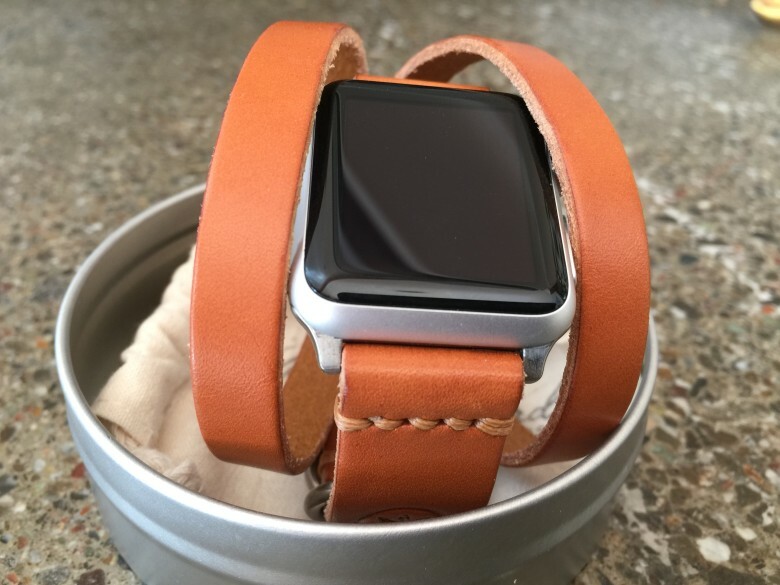 Each Apple Watch strap is made from a solid piece of vegetable-tanned, full-grain leather. The Double Tour is soft and easy for me to put on, and comes in two sizes. I chose from a collection of different buckles and loops to best match my Apple Watch. The hand-stitched waxed thread offers a tailored, slick finish. The Double Tour Split Strap comes in three styles and five colors, ranging in price from $117 to $127 depending on the particulars. Expect a week or more for delivery, as each band is made to order. Arrow & Board sent us a review unit for this article. Read Cult of Mac’s reviews policy.